New Hampshire is known for its beautiful scenery, winter sports, and various granite formations. Unfortunately, sports betting isn’t among the selling points of their tourism bureau, as the practice is forbidden. This policy has been in place since 1992, when the Professional and Amateur Sports Protection Act made gambling on athletic events illegal in all but four U.S. states. In this article, we’ll look at the status of sports betting in New Hampshire, as well as the various teams that are present throughout the state. While the information contained below is meant to be accurate, anyone who’s serious about gambling on sports should consult with an attorney before getting started. According to the laws of the state, “‘Gambling’ means to risk something of value upon a future contingent event not under one’s control or influence, upon an agreement or understanding that something of value will be received in the event of a certain outcome.” Every game that falls under this definition isn’t prohibited, though, as New Hampshire has a long history with gambling options such as lotteries and pari-mutuel betting. 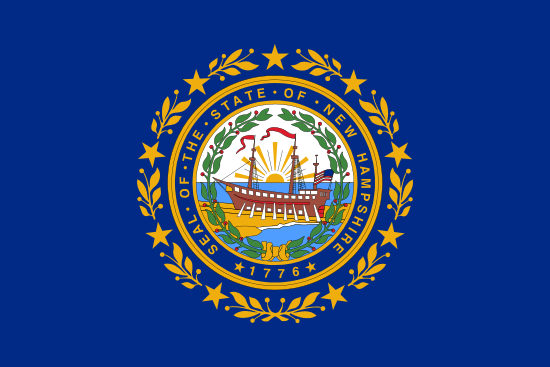 There are no specific laws that prohibit online gambling in the state of New Hampshire. This means residents can track down an online bookmaker without fear of legal repercussions. Sportsbook sites that accept US customers almost universally accept bettors from New Hampshire. Before you open an account, however, I suggest taking the time to do some research. Does the site have a reputation for paying on time? Are there a number of complaints against the site that have gone unresolved? If the answer to either of these queries is “yes,” then you’d be wise to look for another Internet bookmaker. Considering that New Hampshire has the 42nd smallest population in the United States, it should come as no surprise that they lack a professional sports franchise. This is a major blow for sports bettors hoping to wager on the hometown team, although lesser options do exist. The biggest problem with betting on semi-pro teams is the lack of betting odds. An online bookmaker based out of England can’t be expected to set odds for a minor league hockey team on the other side of the ocean, and even underground bookies based in New Hampshire are unlikely to provide such a service. With these options exhausted, the most likely solution is to seek out fans of the teams listed below and make friendly wagers on the outcome of a game. • Manchester Freedom – Founded in 2001, this franchise plays in the Independent Women’s Football League. • Seacoast United Phantoms – This team plays in the USL Premier Development League, which is in the fourth tier of the U.S. soccer league system. • Berlin River Drivers – Scheduled to begin play in 2015-2016, this minor league ice hockey team competes in the Federal Hockey League. • New Hampshire Fisher Cats – A Double-A minor league baseball club that serves as a farm team for the Toronto Blue Jays. • Manchester Monarchs – Scheduled to begin play during the 2015-2016 season, the Monarchs are an ice hockey team competing in the East Coast Hockey League. Auto racing is also a popular sport within the state, both for spectators and gambling enthusiasts. The most notable location is the New Hampshire Motor Speedway, as this oval track has played host to the IndyCar Series, as well as NASCAR events such as the Sprint Cup, Whelen Modified Tour, and the Nationwide Series. Other tracks across the state include Twin State Speedway, Monadnock Speedway, Canaan Fair Speedway, Star Speedway, and New England Dragway. NCAA Division I sports are the only ones consistently offered by bookmakers, so it’s always helpful when states like California and Texas offer a wealth of options. Unlike these massively populated areas, however, New Hampshire is limited to just a pair of universities competing at the top of the collegiate food chain. • Dartmouth College – This Ivy League university was established in 1769, and they currently offer 34 varsity teams for men and women. The importance of athletics is ingrained in the minds of the students, and it’s estimated that 75% of enrolled individuals compete in varsity sports, club sports, or intramural events. The school’s teams are known as the Big Green, and they take part in 16 sports for men and another 16 for women. Their biggest success has come in figure skating, as they won the national title from 2004 through 2008. • University of New Hampshire – The Wildcats compete in 21 varsity sports for men and women. The men’s basketball team has struggled over the decades, never making the NCAA tournament despite being around since 1903. Their football program has been around since 1893 and holds an overall winning percentage of .545. The school’s biggest athletic success has come in ice hockey, with both the men’s and women’s team routinely winning titles. Each year in March, the 68 best college basketball teams meet in a single-elimination tournament to determine the best men’s squad in the nation. This event is known as the “Big Dance” or “March Madness,” and it results in a staggering amount of sports betting action (most of it illegal). In addition to gambling online or with an underground bookie, more casual fans may also take part in a bracket pool. These harmless competitions require an entry fee to participate, and the player must then try to predict the winners for every game in the tournament. If their bracket proves to be the most accurate, then the participant either wins the entire prize pool or gets a cut of the action. Bracket pools are technically illegal, as you’re risking money on a future event that’s not under your control. This doesn’t stop people from participating, however, and even upstanding citizens can be found trying to put together the perfect bracket. New Hampshire sports betting isn’t a booming business, but persistent gamblers can still find a few options available to them. Online bookmakers offer betting lines on athletic competitions from around the globe, and those who prefer face-to-face interaction can always track down a local bookie (although the latter is illegal).